﻿Jim Kelly, LCSW, began his career in the child welfare field, working in agencies specializing in the care and treatment of foster children. He has provided program consultation and staff training to many child-caring organizations throughout his career. He started his private psychotherapy practice in 1988, where he continues to work with children and families, individual adults, and couples. He has been married for thirty-eight years and is the proud father of two grown sons. Browse the shelves of any bookstore or scroll through your favorite online book-selling site and you will find that there is no shortage of self-help books. A quick search of the genre on Amazon revealed astaggering forty one thousand seven hundred and fifty eight titles. With topics ranging from how to “recover your wounded soul” to “discovering your hidden genius,” self-help books are often filled with almost impossible to follow advice and over-used catch phrases. How to be the Adult in the Room challenges“children in grown-up bodies” to advance toward full-fledged adulthood. 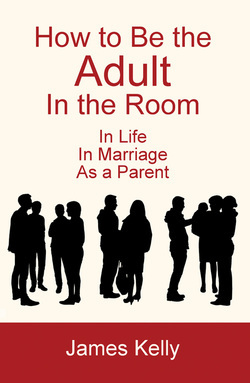 Defining the traits of an adult, Kelly confronts the issues of being the adult in life, in marriage, and as a parent. Based on well researched principles such as personal responsibility, self-acceptance and independent thinking, Kelly leads the reader toward truematurity.